This raw, organic protein powder is derived from organic yellow peas and is an amazing source of highly digestible and bioavailable protein. It is 80% protein by weight, a high ratio similar to brown rice protein. Raw Power Pea Protein Powder is a 100% Raw, Vegan, Organic, Non-GMO protein powder with 22.5 grams of protein per serving! 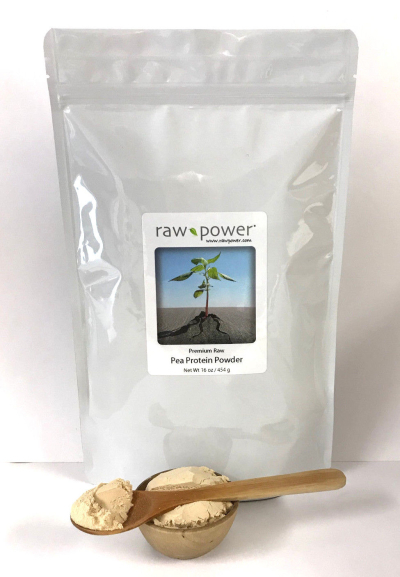 Raw Power Pea Protein Powder delivers an incredible 22.5 grams of fully absorbable and assimilable protein! Mix or blend one or more servings of Pea Protein Powder daily into smoothies, shakes, juices, or other recipes to supplement diet with protein. Suggested usage: Stir or blend two scoops or two heaping tablespoons (1 oz. / 28g) of Raw Power Pea Protein Powder into 12 ounces of fresh juice, water, or smoothie. Combine with fruits and superfoods to make a super smoothie, and take Thor's Hammer tablets with smoothie for Ultimate Nutrition!